I'll freely admit, I am no fashionista. I wear what's comfortable and practical (and affordable). Sweat pants are a winter staple for me, and so is flannel. I don't own designer clothes. I'm not remotely stylish. I do, however, have a little something called class. And taste. Clearly, this gal does NOT have those two words in her vocabulary. I can really only say this: just because you CAN wear flesh-colored leggings, does NOT mean that you SHOULD wear flesh-colored leggings. It's time to purge again, folks...to unburden myself from the random and yet utterly annoying Things I Don't Understand as I encounter them in my day-to-day life. So pull up a chair, if you're not in one already, and let's have a little looksee, shall we? People who park their carts at the store in the middle of the aisle, then walk to look at stuff on one side of the aisle, effectively blocking all traffic in either direction until they're finished. I mean, seriously? Why must they do this? WHY?! 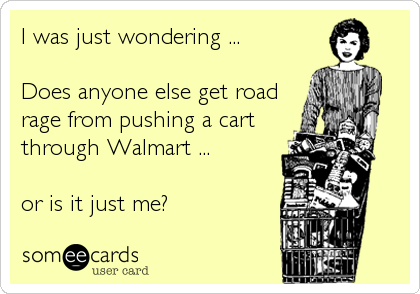 I swear sometimes I just wanna ram my cart into their cart so freaking bad and scream as I get past them, "just take your cart with you, for the love of God!" Parents who let their children turn around and stare at you while you're eating in a restaurant. Yeah, your child might be cute and all, but do I want to stare at him/her while I'm trying to eat? No. There's this thing called manners. You should maybe learn them and then share them with your child. Just sayin. 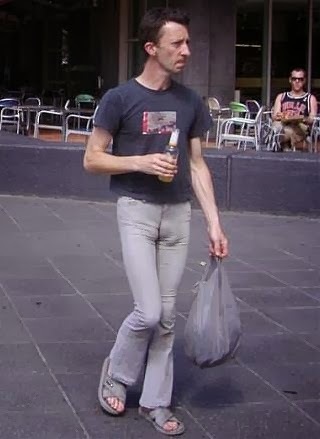 Men whose jeans are way too tight. Because. Ew. And because you really might want your sperm at some point later on. People the Hubs who watch certain movies Transformers over and over and over again and yet complain when you want to watch a movie that you've seen before. If I want to watch Pitch Perfect for the 24th time, then the person who's seen Transformers 37 times should not be asking, "haven't we seen this before?" Rampant misuse of the apostrophe. 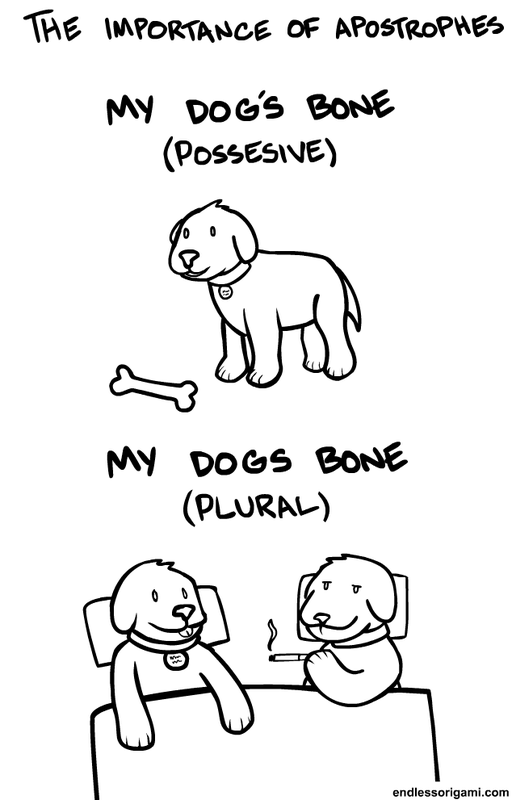 My big pet peeve here is when people put an apostrophe on plural words. It's maddening, I tell you, simply maddening. So hopefully this will help those of you out, who are sometimes in doubt, about how to use an apostrophe. And I was like, HEY, I know that song! So I looked up to see what was on and it was a Bank of America commercial. 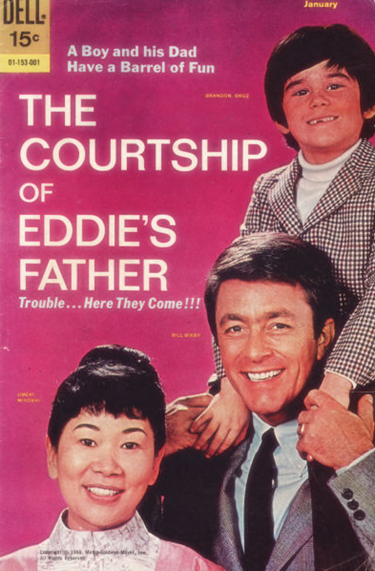 And they were playing the theme song from one of my favorite shows as a child, The Courtship of Eddie's Father. I used to love that show. And I loved Bill Bixby too--whose character was a widow taking care of his only son. My parents were divorced at that time, so I guess I fantasized a lot about having a full time dad in the picture. And Bill Bixby was so sweet, and cool, and full of 70's awesomeness. What's not to love?! Anyhoots...I said to the Hubs, "HEY, that is so wrong of Bank of America to be using that song in their commercial, don't you think?" And he was drawing a complete blank. He had no idea what song that was or what it was from. And being that I know his memory is about as long as a ladybug's foot, I showed him a picture. He was clueless. And suddenly, just like that, the man I love and married almost 30 years ago (this June!) became an enigma. Like, how can a 51 year old man NOT know The Courtship of Eddie's Father?! It's classic television. I question his very humanity in this moment! And all he could say in his defense was that "it sounds like it was a chick show." OK, so then I had to ask..."but you've seen The Nanny and the Professor, right?" "What about, The Ghost and Mrs. Muir?" Ding, ding, ding! We have a winner, folks. The Hubs has actually seen My Three Sons! And he looked just like Ian Somerhalder when he shook his head, yes. OK, I might be lying on that last point. But I still think my quasi-righteous indignation was totally justified at his ignorance with regard to television shows that entertained me in my youth. I mean, it isn't that he'd never watched them--it's that he never even HEARD of them! Seriously, that's just all kinds of weird. And it's also very weird that Bank of America is using the theme song to The Courtship of Eddie's Father as its commercial accompaniment. I mean, the tune that brings to mind images of a widowed father, his son, and their sage Japanese housekeeper, Mrs. Livingston, doesn't exactly seem relevant to marketing a bank. But hey, at least it inspired a blog post, right? Labels: Ian Somerhalder, Reaction Gifs, Remembering, The Hubs & Me, WTH?